Anyone who depends on a generator for emergency power understands that the generator is only as good as its control unit. The control unit must be dependable when switching from utility to standby power. At Taylor Power Systems, we understand this and have designed control units with the user in mind. Our Microprocessor-based Control systems provide a versatile system for gen-set control, protection, and monitoring. The panel's back-lit LCD display provides readout of all critical information with digital accuracy - assuring complete engine protection. The microprocessor design allows customization of the controller's functions to fit virtually every application's needs. The DGC-2020 is a microprocessor based generator set controller that incorporates advanced technology and features into a user friendly rugged design. The DGC-2020 provides integrated engine-genset control, protection, and metering. 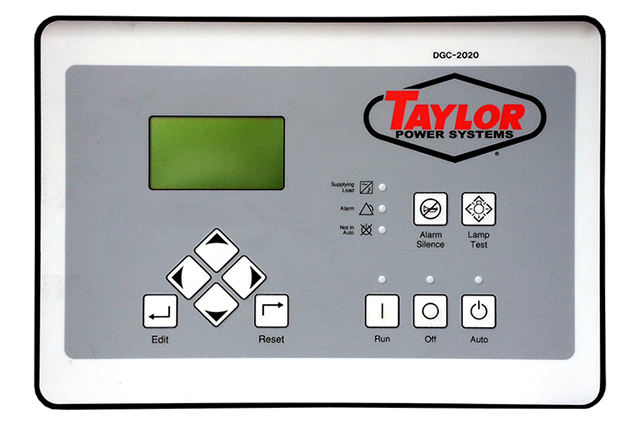 Front panel controls and indicators enable quick and simple operation.This device is encapsulated and is the most rugged genset controller found anywhere. It can sense engine parameters directly via analog senders, or it can communicate with engines ECU using SAE J1939 CANBUS communications. For Spec. Sheet Information on the DGC-2020, Click here. The RDP-110 is used in conjunction with the DGC family of Digital Genset Controllers to provide remote annunciation of the emergency standby generator system. This panel complies with the requirements of NFPA 110. The DGC detects an alarm or pre-alarm condition and communicates via RS-485 to the RDP-110. The RDP-110 is available in two mounting configurations, surface and semi-flush mount. For Spec. Sheet Information on the RDP-110, Click here. 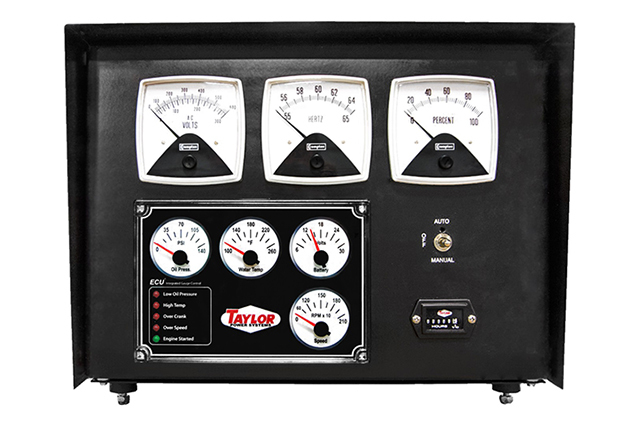 Our analog control panels are built for dependability and ruggedness, with large analog gauges that enable the user to monitor load and other functions at a glance. Our analog control panel will automatically start and monitor engine conditions in order to protect your investment. The three large analog gauges, at the top of the unit, display the generator output in voltage, the speed of the generator set in Hertz, and the percentage of load on the generator. The Control Toggle Switch enables the user to switch the generator from off to the manual or auto position. The Running Time Meter displays the number of hours the generator set has run. The ECU provides complete automation and safety monitoring of the engine. It controls the starter and fuel. A built in speed switch controls both starter disengagement and overspeed protection. The ECU automatically cranks, runs, and monitors the engine for overcrank, overspeed, high water temperature and low oil pressure.